Recently an inspiring variety of 13 new interviews have been uploaded onto the NanoDiode YouTube channel. 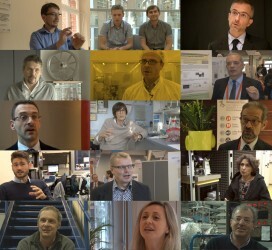 In these 90 seconds video clips, all created by Studio HB, various nanotechnology-related experts discuss their challenges, expectations, worries and hopes. Among the new interviewees are i.a. researchers of the Elettra Synchrotron Light Laboratory in Trieste, the VTT Technical Research Centre of Finland, Veneto Nanotech and the Universities of Graz, Padua and Torino. They all share their insights about the ethical, legal, scientific, societal and health dimensions related to the field of nanotechnologies. Please go and visit the NanoDiode YouTube channel and share your questions and thoughts about responsible research and innovation. In the following months Studio HB will create another 15 clips in Belgium, Norway, Spain, Germany and the UK. Stay tuned!